Speaker of the Year organised Speak-Shoot and Personal Interview round on 22 November 2018 . Diya Gogia and Tijil Yadav from class VII were awarded the sash for Best idea and Best speaker. 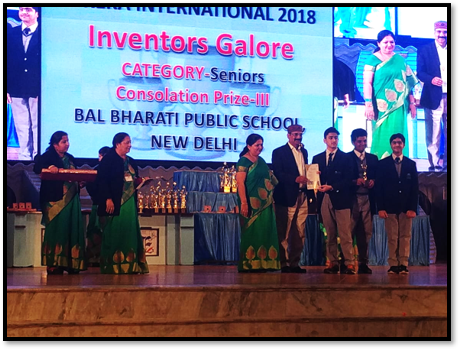 Aanchal Aggarwal, Aadya Aggarwal, Shashwat, Divya Soni, Manit Singh and Abhinav Ranjan from classes VII- IX were awarded trophies for Fabulous Expressions. The SOTY also honoured the school with a trophy for outstanding participation for the Principal and teacher coordinators. Diya Gogia , Tijil Yadav, Divya Soni, Manit Singh and Abhinav Ranjan have qualified to participate in the finale of SOTY to be held on 19 January 2019. Lakshit Bansal, Pratham Singhal, R. Naveen Kumar and Yuvraj Singh of (XI C) are among the 20 students of class XI from all over Delhi to have qualified to attend the State Level Camp of Vidyarthi Vigyan Manthan (VVM) which commenced on 13 January 2019. VVM is a national Program for educating and popularizing science among school students of VI to XI standards. Vivaan Gupta (III F) won 'Trail of the Tail Contest' published in the Young World, a supplement of The Hindu, on the 5 October 2018. Arya Anand and Mukul Chadha of XI D, won the Third prize among 51 teams which had qualified for the final round of Hackathon organized by Toyota and IL & FS Education on Road Safety–Code for Safer India They won a medal, certificate and cash prize of Rs. 10,000/-. Ishya Jain (I F) won Certificate of Excellence in National Level Children’s Art Competition, “India’s Master Artist Junior 2018”organized by People’s Art Foundation on November, 2018. Ishya Jain (I F) was awarded ‘Commendation Award’ in the in 7th All India Children Art Contest Colours of National Symbols 2018 Exhibition held from 1 to 30 November 2018 at India Habitat Centre. Vedika was awarded with Gold Medal in the in 7th All India Children Art Contest Colours of National Symbols 2018 Exhibition held from 1 to 30 November 2018 at India Habitat Centre. 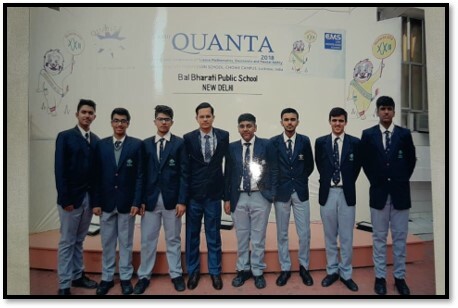 In Quanta 2018, organised from 23 to 27 November 2018 by City Montessori School, Lucknow, a team of seven students of the senior secondary department competed with students from across the globe in varied science based activities. In quiz Acta Mathmatica, Ansh Tandon (XI C) and Somaditya Singh (XI C) bagged the first position and in Mental Ability Test also, Somaditya won appreciation for Honourable Performance. A team of ten students from the School participated and competed in the prestigious 12th Eureka International from 16 to 18 December 2018 held at the CMS Lucknow. Seventy-two teams from various schools of India and neighbouring countries competed for the coveted trophies with zeal and innovative ideas. The Overall Winners Trophy in Senior Category was bagged by our school team for its excellent performance. Surubhi Kataria (XI B), Aditya Kanhar (XI D) and Pratham Goel (X B), were accorded Consolation Prizes amongst 2.5 lakh national and international schools in the Terre Green Olympiad, an online quiz, focusing on environment, organised by Terre Policy Centre. 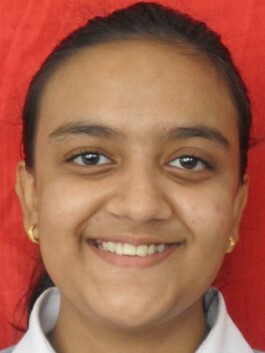 Tushita Srivastava (XII B) is amongst the seven students from all over the country to have won the scholarship of Rs. 1 lakh in the competition, ‘Go Laadli Lead Like a Challenge’ organized by Go Laadli – a nonprofit organization, incorporated and registered in the state of Ohio, USA. Bharvi Nayak Kalita of class VI B participated in a District Level Philately exhibition- FESTIPEX- 2018 under the Deen Dayal Sparsh Yojna. She stood first and was awarded scholarship for the same. The prize ceremony was held at Salwan Public School, Rajinder Nagar on 2nd November 2018. Bal Bharati Public School, Pitampura organised the Annual book day ‘Zenith’ from 30th October- 1st November, 2018. Our students participated in series of events along with fourteen other prestigious schools of Delhi. In the social Science activity ‘Battle of Words’, the students had to present an enactment in the form of a multi dimensional conversation between the two famous personalities. Vaatsalya Babbar of class X D and Shashwat Gupta of class IX G enacted the conversation between Mr. Narendra Modi and Mr. Imran Khan. The outstanding performance of the team bagged them the third position. Two students of middle department- Niel Chhabra and Dhruv Chadha of VI C participated in Science event ‘Trash to Treasure’ in which they prepared a working scientific model on ‘Hydraulic Crane’. This was followed by a brief presentation of the model and the related principle. They secured first position for their commendable efforts. A General Knowledge Quiz ‘Know for Sure’ was held at DL DAV Darbari Lal School, Pitampura on 3rd May, 2018. 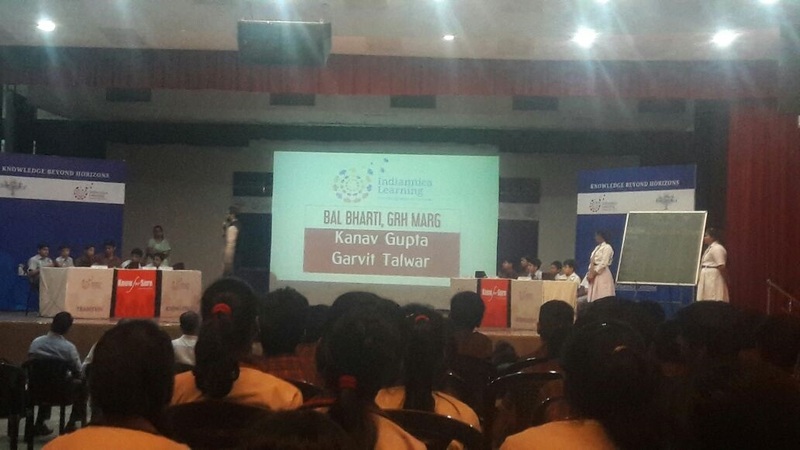 Two students from our school- Kanav Gupta and Garvit Talwar of VIII B participated in the event. They cleared the initial written round and were amongst the top six teams shortlisted out of sixty five competing teams. A comprehensive final round of quizzing was then conducted by the renowned Quiz Master Mr. Ajay Poonia. Our team stood third in the event. 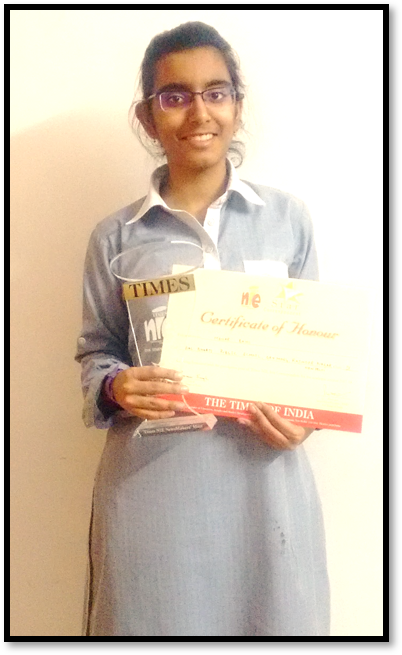 Mehar Behl (XI A) was selected amongst the ten Star Correspondents from over 300 NIE School Reporters from all over Delhi and NCR in The Times NIE Newsmakers Meet 2017-18. She excelled in the Evaluation Exam and was felicitated with a Times NIE Star Correspondent badge and a Certificate of Honour. As a Star Correspondent, she shall get the opportunity to write for the Times NIE student edition and see her name in print. Aditya Moza of class VIII A stood first in the Inter District English Extempore Competition held on 20th November, 2017 at RPVV Civil Lines. The topic given to him was ‘Mobile phone impact on young children’. There were twelve participants from various districts and Aditya’s oratory skills proved him the best in the junior category. Swapna Alase of XII A mesmerized the judges and audience with her kuchipudi dance moves at the State Level ‘Solo Classical Dance Competition’ held on 24th November, 2017 at SKV, Gulabi Bagh. She secured the second position in the event. On 6th November, 2017, Inter Zonal Band Competition for boys and girls was hosted by Bal Bharati Public School, GRH Marg. Six teams from different zones participated in the event. Our school team comprising twenty five students stood first in the boys category and has qualified for the state level. They played the following tunes: Jai Mala March, Bedu Pako, Fun Flare and Saare Jahaan se Achchha. Solo Classical Dance(boys and girls) at the district level was hosted by Bal Bharati Public School, GRH Marg on 3rd November, 2017. Thirteen teams from different zones participated in the event. Ishmeet Ahluwalia of VI F stood first in the Jr.(girls) category. Her elegant kathak moves were appreciated by one and all present. Swapna Alase of XII A also stood first in the Sr.(girls) category. She mesmerized the judges with her kuchipudi dance. Both the girls have been selected to perform at the state level. Folk Dance Group Competition at the District Level was held on 27th October, 2017 at SBV, Rouse Avenue. Our team comprising twenty four outstanding dancers under the guidance of Mr AVL Raghavendra and Ms Suchita stood first and were shortlisted for the state level performance. They performed Telangana folk dance. Solo song for girls at the District Level was held on 6th October, 2017 at Happy School, Daryaganj. Sohini Saha of XI B won the first position in the classical category whereas Ratee Bahree of XI G stood second in the semi classical category. Hindi Extempore competition for boys and girls at the District Level was held at SKV Mata Sundari Road. Sukriti Srivastava of VI D from the junior category stood second whereas Vibhor Vanvani of IX G stood third. The topic given to them was ‘ Beti Bachao Beta Sikhao'. District Level Instrumental Competition for boys and girls was held at JPM Senior Secondary School. In the junior category, Vanshika Jain of VIII A played violin and stood first. Chinmaya Budhiraja of VII D stood third. He played Tabla. In the senior category, Akshit Sehgal of XI D also played tabla and stood first whereas Tanmay Aggarwal of XI G stood second. He played violin. District Level English Declamation Competition for boys and girls was held on 9th October in Carmel Convent School, Chanakyapuri. The topic for the same was ‘Ill effects of reducing girl child on society’. Four students from our school participated in the event and all of them were declared winners. Sanskrit Shloka Uchcharan Competition at the District Level was held on 9th October, 2017 at RPVV, Link Road. Our team of six students under the guidance of Mr. Yuvraj chanted shlokas on ‘Friendship’ and stood third. Band Competition(zonals) was held on 1st September, 2017 at Chowguley Public School. A team of twenty four students from our school participated in the event. They played the following tunes- Jai mala march, Bedu Pako, Fun flare and Saare jahan se achcha. They were awarded second position for the same. Folk Song(zonals) for boys was held on 30th August, 2017 in our school. A team of sixteen students from our school participated in the event.They sang an Awadhi Song. The judge applauded them for their melodious tunes. They secured the first position. Zonal Hindi Debate for girls was organised by RKLM Girls Sr.Sec. school on 30th August, 2017. The topic for the same was ‘Yog hamare dainik jeevan ka hissa hona chahiye.’ Devangi Dhawan and Diya Gupta both from VI B spoke for and against the topic respectively. They were declared winners of the day. Zonal Group folk Dance Competition for girls was hosted by Nutan Marathi school on 28th August, 2017. Our vivacious team of 24 students performed the Telengana folk dance and were declared winners amongst the nine participating teams. The participants were: Jiya Chugh- VI B, Ishmeet Ahluwalia- VI F, Asmi Kathuria- VI F, Kamya Agarwal- VI G, Tanvi Kapoor- VI G, Moksha Chand- VIII A, Toshi Pahadia- VIII B, Syna Rajvanshi- VIII B, Grisha Tongaria- VIII C, Ananya Chaturvedi- VIII D, Shreya Khandelwal- IX F, Shivanshi Lal- IX F, Tanishka Karan- IX F, Paavni Kalra- IX G, Ananya Dogra- IX H, Rishita Sethi- X A, Somya Gupta- X A, Shivam Gupta- X E, Sanya Malhotra- X D, Sohini Saha- XI B, Ratee Baharee- XI B, Swapna Alase- XII A, Raisha Bhatia- XII B & Dedeepya Galla- XII B.
Sanskrit Shlok Competition(zonal) for boys was organised by Govt. Girls Sr. Sec. School, Paharganj on 21st August, 2017. Sidhant Gogia of IX B stood first in the Senior category. He recited shlokas on ‘Mitra Stuti’. English Debate for girls at the Zonal level was held at SBV, Rani Jhansi Road on 19.8.17. Our school was the proud winner in both junior and senior categories. Kakkar of VII B and Diya Gupta of VIII B bagged the first position by debating for and against the topic ‘Yoga should be compulsory in our education sysytem’. On 17.8.17, GD Salwan school hosted Hindi Extempore (zonal) competition for girls in the junior and senior category. English extempore(zonals) for girls was held on 10th August, 2017 at RPVV Link Road. In the junior category, Tanisha Jain of class VIII secured second position. The topic given to her was ‘Sports should be a part of curriculum’ Her confidence was appreciated by all present. Ridhima (III F) and Rishit Sharma (III B) won the first prize at the Zonal Solo Dance Competition organised on 8.8.17 at C.L.Bhalla DAV Senior Secondary School, Karol Bagh in the girls and boys category respectively. Hindi Poem recitation for girls was organized at BRD, SKV, Prasad Nagar on 8th August, 2017. Devangi Dhawan of VI B bagged the first position in the junior category. The title of the poem recited by her was ‘Pathher bani Aahiliya’. Zonal Hindi Poem Recitation for boys was held on 5th August, 2017, at BRD SKV, Prasad Nagar. Our well deserving poets managed to steal the show once again. Poorav Dhingra of VIII A and Piyush Sharma of X H stood first in junior and senior categories respectively. On 4th August, 2017, Zonal English Essay writing competition was held at DTEA, Pusa Road. The topic ‘Save the environment’ was given on the spot. Both Mohit Mohapatra of VIII A and Suhani Talwar of VIII G were declared winners with the first position. On 26th July, DI Khan school hosted Solo song competition for Primary category under the Zonal cultural programmes. The young male singer from our school was Satvik Behl of IV H who was awarded the first position. Kavya Mudgal of IV F in female category stood second. On 26th July, RKLM Girls SSS hosted Zonal Mono Acting competition for schools of Central Delhi. The competition was open for both boys and girls in Junior and Senior categories. Our budding actors performed in professional style. Out of 11 competing teams, our participants won the coveted positions. In junior category, Suhani Grover of VIII A stood second while Chirayu Dhawan of the same class came third. In the senior category, Tanuj Sharma and Aashna Chawla of XI A came second and third respectively. On 24th July, a Solo Dance Competition was held at RPVV as a part of cultural programmes organized under zonals. Ishmeet ahluwalia of class VI H performed kathak while Swapna Alse of class XI A performed kuchipudi.The girls had a tough competition from 15 competing schools of Central Delhi. They proved their dancing prowess by bagging first and second positions in junior and senior catrgories respectively. On 24th July, Hindi and English recitation competition for the primary department was held at Sarvodaya Bal Vidyalaya(SBV) under the Zonal Cultural Programme. Eleven teams from Central Delhi participated in the event. All the four talented participants of our school won prizes. 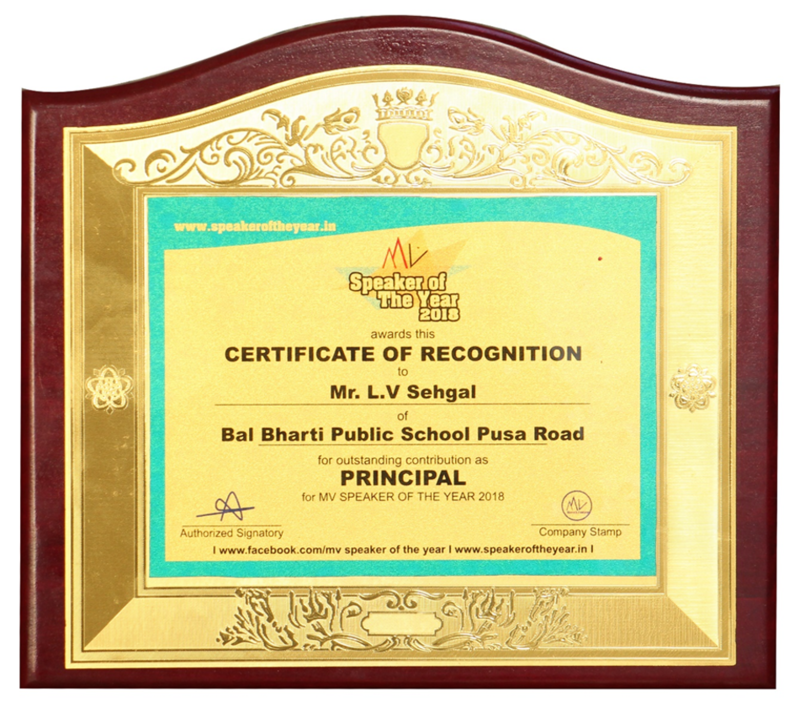 In Hindi Recitation, Satvik Behl of class IV H came first while Bharvi Nayak of class V C stood second. For English, both Ishani Dhingra and Adhyan Sharma of VG stood second. Lions Club organised ‘The Pavan Chaudhry Annual Inter School Debate Competition’ on 15th December, 2017. The topic for this year’s debate was 'Sadan ke mat mein pradushan ko rokne ke liye sarkar paryapt kadam utha rahi hai’. Gunjan Sachdeva of IX A and Vibhor Vanvani of IX G participated in the competition amidst participants of seventeen other leading schools of Delhi. Vibhor spoke against the motion and was awarded a consolation prize of Rs.1,000 along with a memento. a) Poetry with a twist- Saniya Virmani of VIII A and Suhani Talwar of VIII G participated in this event on 15th November. The participants were asked to compose poetry on the titles of 10 pre selected library books. They composed a poem on nature and gave an outstanding presentation. Out of fifteen competing teams, they bagged the first prize. b) Fun with Magic: Sanvi Butta of VII D and Vidhi Sharma of VIII A participated in this mathematical event on 15th November along with eleven other teams. They were asked to build a mathematical board game. They constructed and confidently presented a game ‘Mr. X’ based on the concept of linear equations. They stood second in this competition. c) Hues with creativity- The participants were required to create a story using a comic strip on the topic ’24 hours in a room’ given on the spot. Ten teams competed in the event. Our team of two students- Tanish Anand of IX E and Rohit Jain of IX C stood third. Annual Commerce and Economics(ACE) Fest was organised by DPS Dwarka. Jitya Taneja of XI C and Sarthak Mishra of XII E participated in ‘MEMECONOMICS’( an online event) on 25th October, 2017. They created five memes based on a variety of economics concepts like giffen goods, demand, supply, role of assumption in economic theory etc. They stood first in the competition. 'Ignite and Axiom Festival, 2017' was organised by DPS, Dwarka on 24th and 25th October, 2017. 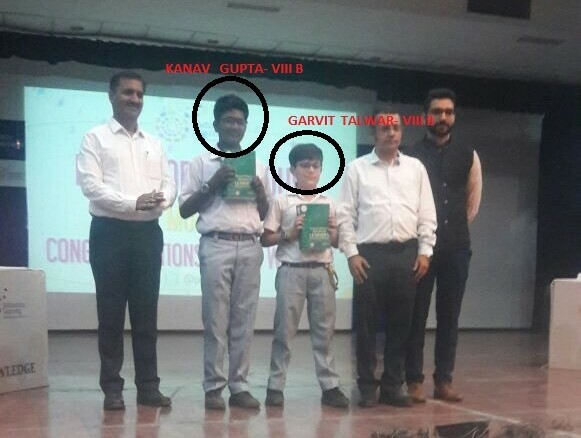 Our students participated in numerous events..
Ansh Tandon and Kartik Mandar of class X H secured third position in ‘Problem Solving’ out of 30 participating teams. The participants had to attempt subjective and objective problems based on various fields of Mathematics including algebra, geometry and combinatorics. Twenty Five enthusiastic children with a lust to perform and achieve in their eyes went for an Inter School Competition ESPRIT organized by Bal Bharati public School, Noida on 08.09.2017. • My Mascot, My Pride. Perry Chabbra of Class III E , Bal Bharati Public School , Pusa Road Campus was the proud winner of the 'Get Lucky Crossword Contest' published in the 21 July , 2017 issue of 'The Young World' , the children's supplement by the leading newspaper ,'The Hindu'. She made the school proud yet again when her paintings depicting the beauty of nature and colourful Rajasthan were published in the Scrapbook Corner of 'The Young World' editions dated , 4 August, 2017 , 18 August , 2017 and 25 August , 2017. Madhav Gupta of IX G participated in the competition ‘Light Camera Action’ organised by Bal Bharati Public School, Dwarka under the event ‘Tech Quest- 2017' held on 23rd August.The participants were required to prepare and submit a movie of 3 minutes on the theme ‘Humanity and you’. Sixteen schools participated in the competition out of which Madhav stood second. His movie depicted the efforts of a young girl in helping a poor boy to study in a school. Delhi Public School, R.K. Puram organised its Annual Instrumental Competition ‘Swargdeep’ on 19th August, 2017. A team of nine students from our school participated in the event. The competition was open to the students of classes VI to XII. The composition for the Orchestra was ‘Drut Teental’ followed with Jhaala. Our talented instrumentalists stood third amongst fourteen participating schools. An online Inter School French Competition named ‘Amusons- nons la nature’ was organised on 10th August by DAV, Shresth Vihar as a part of their Annual Fest- Effusion and Techesta- 2017. 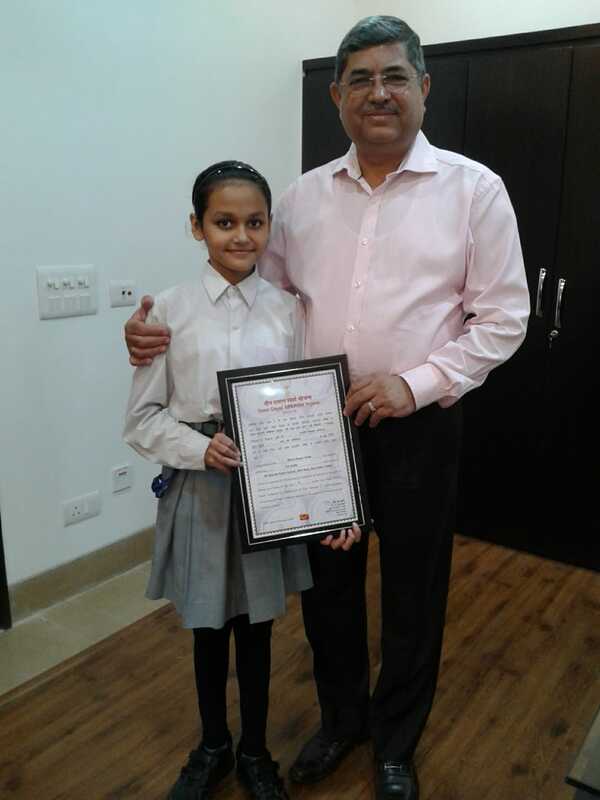 Naira Kakkar of VII B was awarded the first prize in the French Poem Recitation. She was appreciated for her pronunciation, fluency and use of props. On 5th August, 2017, Delhi Public School hosted its annual event Enship 2017 under which various activities were organised to test the entrepreneurial skills of the students. Tejas Ganotra of XI F bagged the third position in a surprise event. The participants were required to clear two levels. The first level tested their gaming skills through a video game ‘Race the sun’ and the second round was a prompt round in which participants were required to write USP of a smartphone which can change the whole mobile market and compose a jingle for the same. BBPS, Indraprastha Yojana, Ghaziabad organized a two day fiesta of inter school competitions named ‘Rhapsody’on 27th and 28th July, 2017. Our students participated with great fervour and enthusiasm. Vision vista- The participants had to prepare a PPT on the topic ‘My school, My vision’. Parul Varandani of VII A and Aviral Gupta of VIII A stood second in the competition. 3D wall magazine- Participants were required to prepare a wall magazine on the bulletin board provided by the school. The topic for the same was ‘Digital India’. Priyal Maini and Trisha Gupta, both from VIII H were awarded the second prize for their creativity. Rhythmic yoga- Participants had to present yoga postures along with the music of their choice. Iaana Kakkar of Pre-Primary A participated in Show and Tell Competition in Doon Public School on 28-7-2017. The topic she presented was to unfold “Nature’s Bounty” by selecting “Cactus of Sahara Desert”. She unwrapped myriad miracles from nature on stage with excellent actions, voice modulation and creative props to emphasize this gift of nature. Iaana bagged II position with her effective speaking skills. Students of Photography Club bagged First Position in Expressions India Film Festival 2017. The event took place on 20 and 21 July 2017. It was a National Level Competition where 40 teams all over India participated. Movie was based on Family Bonding and title of the movie was 'IMLI'. The competition required an in depth study and understanding of chemistry. Our students stood third in the event ‘Wonders with Glassware’. The participants were: Ashmita Mallick- VI A and Aditi Daga- VII A. In addition, our school was awarded the overall running trophy. On 14th July, Friday, N.K Bagrodia Global School, Dwarka, celebrated the French National Day (Bastille Day) with immense enthusiasm. The day "Soif d'Apprentissage" consisted of three events: "Test Your Knowledge", "Comic Strip" and "Chorists". 15 schools participated and our school bagged I Positions in two events: namely, "Test Your Knowledge" and "Comic Strip". AarnaGupta(I D) won Ist Position in Art Competition “51st The Statesman Vintage & Classic Car Rally” Organised by Raghuvansham School of Modern Art held on 26 February 2017 at National Stadium, Delhi. Plot No 6, Jhandewalan, New Delhi. Kya Hamara Samaj Bujurago ki suraksha ke Prati Samvedansheel hai?